Allow visitors to send a quote for multiple products at a time. Quote Cart adds a store like experience even for products without price! Now your users can add unlimited products with or without price to cart. You will get a multiple product quote right to your inbox with all customers details! Each product page gets an add to cart button. Product with and without price can be added to quote cart. You can add your cart to the sidebar with simple drag and drop widget. 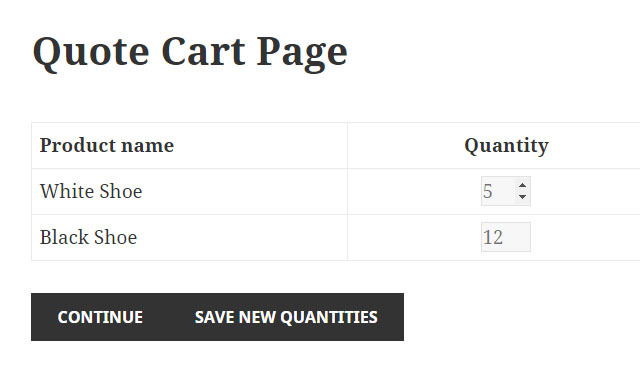 The quote cart summary page contains the products details and quote form to collect all necessary data from your customer. The checkout form is fully customizable in drag & drop forumbuilder. The notification emails are fully customizable in product settings. If you need any additional features you are welcome to contact us. As always we will be happy to add new functionality! Configure quote cart settings: quote cart page, thank you page, notification emails etc. See Add to Quote buttons on product pages and lots of new inquiries!